Rinse the chicken with cold water, remove the giblets, and pat dry with paper towels. Preheat the oven to 450 degrees Fahrenheit. Smear the butter with your hands all over the bird. Put the chicken in a roasting pan that will accommodate it with room to spare. Season liberally with salt and pepper and squeeze the juice of one lemon all over it. Put the herbs and the one garlic clove, crushed, into the cavity, together with the squeezed-out lemon halves. Roast the chicken in the oven for 10-15 minutes. Baste, then turn the oven temperature down to 375 degrees Fahrenheit and roast for another 30-45 minutes with occasional basting. 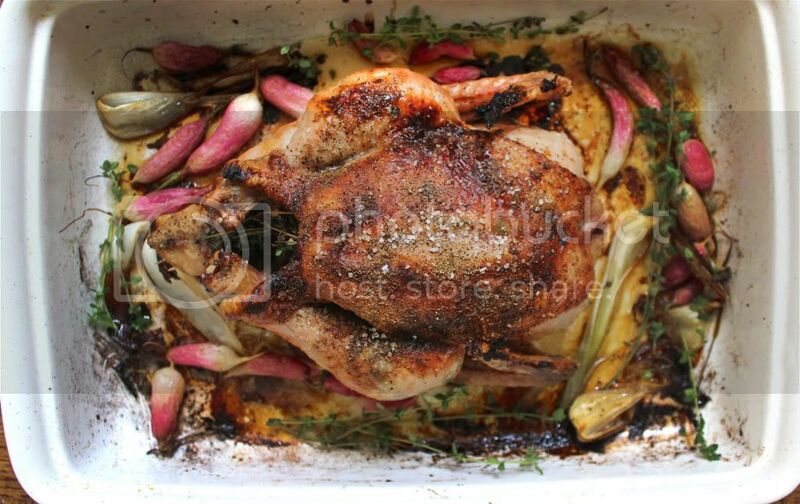 About 15 minutes before the bird is done roasting, take it out of the oven, mix in the radishes, spring onions, and the rest of the garlic cloves and swirl around in the pan juices to coat. Stick the whole thing back in the oven for the remainder of the roasting time. The bird will be golden brown all over with a crisp skin and have buttery, lemony juices in the bottom of the pan. The veggies will be lightly roasted and delicious. Carve the bird as you like. With this roasting method, there's no need to worry about making a separate gravy--the juices in the pan is a perfect amalgamation of butter, lemon juice, and chicken juices and that's all you need. Give it a little whisk and you have the most wonderful gravy imaginable.